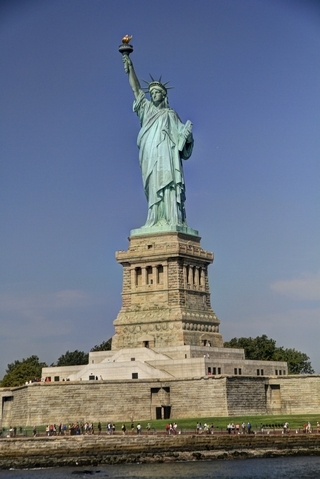 Another hot day in New York City and we spent it visiting the Statue of Liberty and Ellis Island. Today we learned a good reason why you shouldn't always follow the instructions on your GPS --- the route the GPS picked was estimated to be less than 20 minute. In reality it took slightly over an hour. OK, I can't totally blame the GPS as there was a lot of traffic and maybe the ridiculously busy and poorly designed intersection that took a half an hour to get through was a factor. I think some intersections should be labelled "avoid at all costs" in the GPS map. I'm sure just about any other route would have been faster. We been to NYC a number of times but this is the first time we've gone to the Statue of Liberty and Ellis Island and I'm wondering why as I really enjoyed the day. 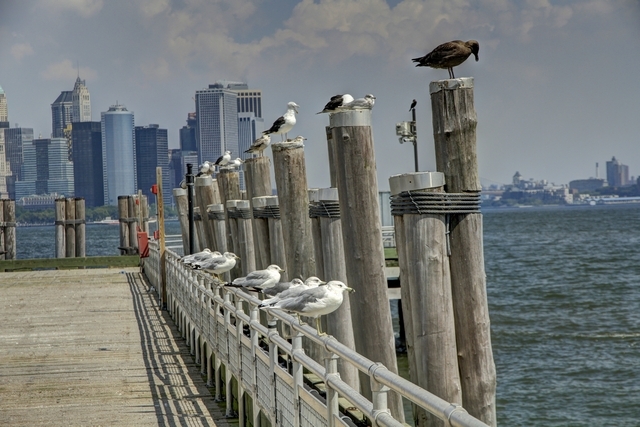 As we are staying in New Jersey we chose to leave from Liberty State Park in Jersey City. 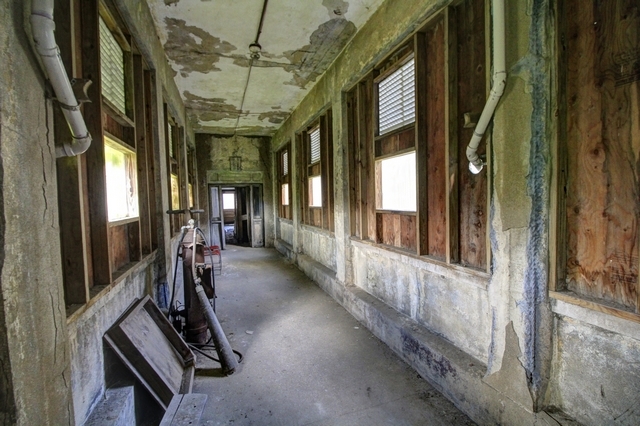 The old train station was damaged by Hurricane Sandy in 2012 as were parts of Ellis Island. 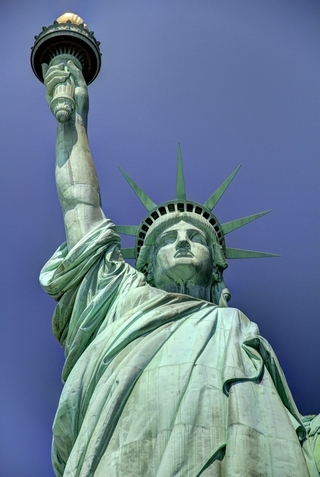 Here she is, the Statue of Liberty. The bottom most layer is an old fort, then a pedestal is built on it. Inside the pedestal is a museum that describes how the Statue of Liberty was built, including conception, design, building and fund raising. 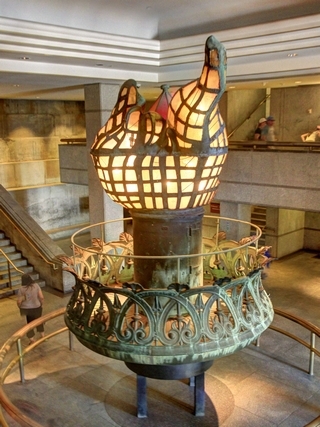 The torch on the statue has been replaced and original torch can be found in the museum. The face is a replica of the actual face on the statue that was made during restoration. I'm standing beside it to give you an idea of size. Next stop on the ferry is Ellis Island. When the US federal government decided to centralize the immigration process they had to find a location. A tiny uninhabited island was chosen. Fill from the subway (which co-incidentally was being built) was used to expand the island. 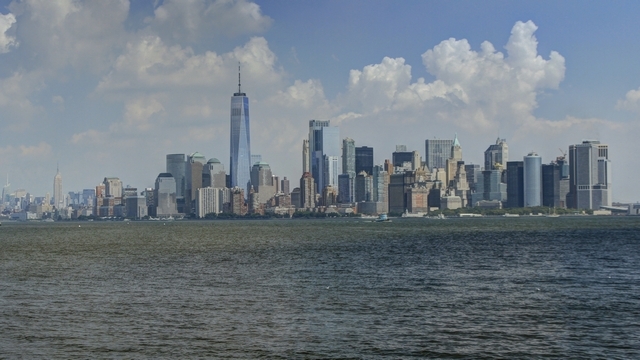 Over the years fill was added creating 3 islands and eventually one, the Ellis Island as we know it today. 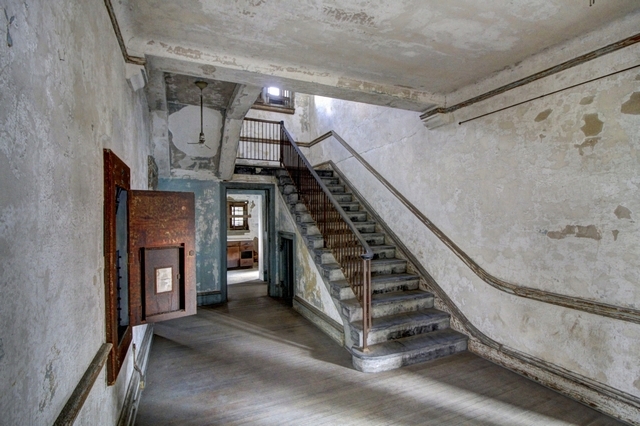 The original building on Ellis Island has become a museum describing the immigration process before visas. This is the inspection hall. 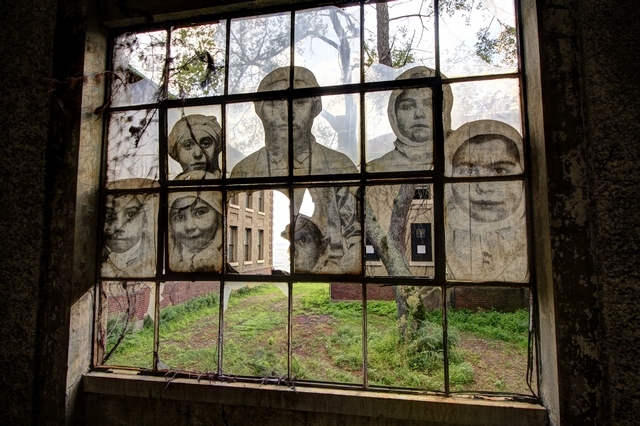 The majority of immigrants were on and off Ellis Island in a few hours. Others with either health issues, financial issues or legal issues could remain there for days, weeks or maybe in a year. Two hospitals were built for treating health issues. John had read some information about a "hard hat" tour which takes you into areas of Ellis Island that are closed to the general public. A general hospital was built then a psychiatric / infectious disease hospital was built. Portions of the general hospital have collapsed as a result of damage that occurred during Hurricane Sandy so the majority of the tour was in the psychiatric / infections disease hospital. 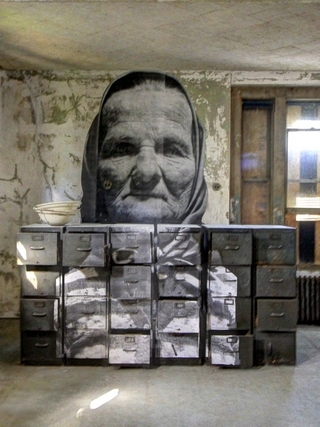 The French artist JR made copies of original Ellis Island photographs, enlarged the photographs and mounted them throughout the hospital. 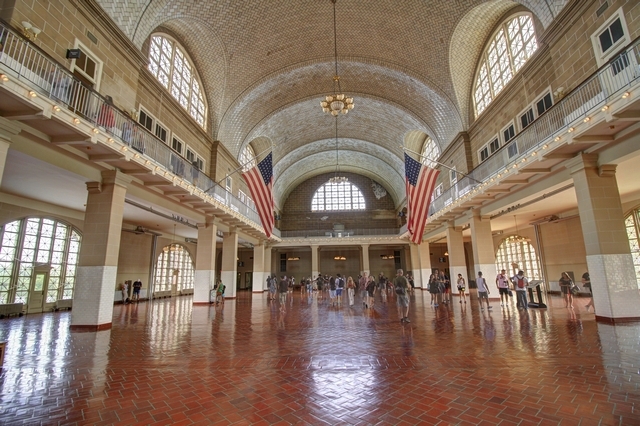 During WWII Ellis island was closed for immigration and opened as a coast guard training station. Here one of the photographs is split between the wall and the abandoned file cabinets from the coast guard era. Our guide explained that even the electric panels have a story to tell. Notes written on the panel are clues to the types of medical equipment used in the hospital. 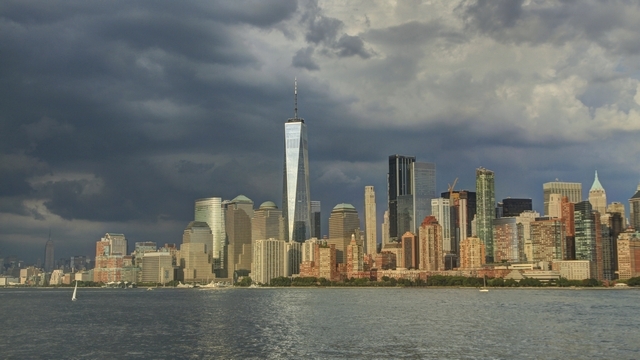 On the ferry heading back to New Jersey we see that the sky has changed. Luckily, we made it back to the car before the rain arrived.